How wine works l Why should wine be decanted? Should I decant wine? This is a question which is all too familiar and often goes unanswered, however we are here to help you find the answer to this baffling wine topic. Under our helpful, ‘how wine works’ blogs, we aim to help you with your wine tasting experience; making it an enjoyable and memorable occasion. Decanting wines is the best way to ensure you enjoy a wine to its fullest. Some wines today do not need decanting as they have been thoroughly clarified during the wine making process, however other wines definitely benefit from decanting. Typically speaking these are wines which have aged in bottle. This would generally be red varieties where sediment is often present and the aim is to separate the wine from its sediment. If these wines are not decanted properly, it can often leave an unpleasant taste on the palate as well as occasionally being displeasing to the eye. Decanting also allows air into the wine, releasing the complex aromas. If wines deteriorate after decanting (and have not been over decanted) this is a sign that the wine is probably corked. Younger wines also benefit from decanting by allowing the wine to breathe and increase oxygenation. This encourages a wines flavour to develop, opens up aromas and softens the ‘youthful bite’. Finally, the presentation of wine in a crystal glass decanter adds to any table setting creating a delightful ambiance; something which is not as easily achieved with a bottle of wine placed on a table. How far ahead do I decant my wine? How do I decant old/young wines? In most cases you simply want to get air into the wine. For young red wines this can be from half an hour to three hours prior to consumption. Old wines however do not normally need to be decanted for as long and can usually be decanted just before consumption. Older wines occasionally oxidise far more quickly when they are released from the bottle which is why this last sentence is important to understand. Not all old wines will oxidise quickly but it must be understood that they may and this is why we recommend an occasional check on the decanter once the wine has been decanted. The secret is to drink the wine at its optimum flavour and aroma peak before it begins to recede from the effects of oxidisation. We all suffer with age eventually!! It is important to remember that you can always let wine develop in your glass. However you cannot reverse a wine back to its original state if it has been over decanted. If you are decanting old wine pour slowly into the wine decanter, without letting any sediment leave the bottle. Alternatively, if you are decanting young wine pour the bottle directly into the decanter. The ‘splashing’ into the vessel will help promote oxygenation. How will decanting wine enhance the wine tasting experience? Decanting wine reduces the amount of carbon dioxide and matures the wine. This allows the bouquet and flavours to develop faster. Once red wine is decanted the levels and complexity of fruit flavours are released to their full potential. Try the following exercise if you are still unsure about the benefits of decanting wine. Using identical wine glasses decant half of your chosen bottle of wine and serve the other half directly from the bottle. Taste and draw your own conclusion. 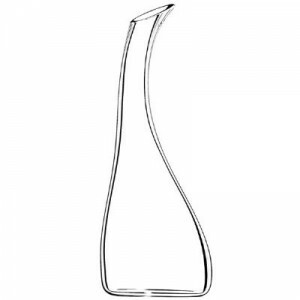 If you’re looking for a practical and long lasting wine decanter we can help you. The following wine decanters are our most requested and most popular designs. This remarkable wine decanter from renowned glass makers Eisch Glas will prevent those dreaded red wine stains on your tablecloth. The special no drop effect treatment is guaranteed by the rim of the decanter. The ergonomic design allows you to easily pour the contents and is the best option for oxidising your red wines. This is also available for purchase in a Wine Decanting Set. Smooth, stylish and sleek are the first words that spring to mind when you see the Riedel Cornetto Single Wine Decanter. Forget looks, it is also extremely practical and is perfect for decanting wine. It adds a classic look to any table and its slender shape is eye-catching to say the least. Your guests (or customers) will want to walk away with one of these after seeing it in action. 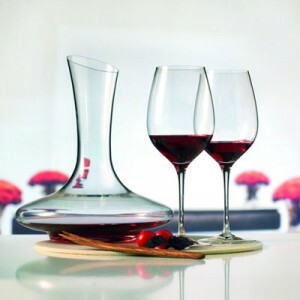 Do you own a wine decanter? And if so, how often do you use it? Let us know what your thoughts are on wine decanting and any tips you have learnt along the way. After all, wine tasting is an experience to be enjoyed and shared. You missed out one of the main reasons WE decant wine – to disguise the ugly labels, and hide the discount origins, of wines gracing an elegant dining table! Thank you for your comment and taking the time to read out decanting blog.